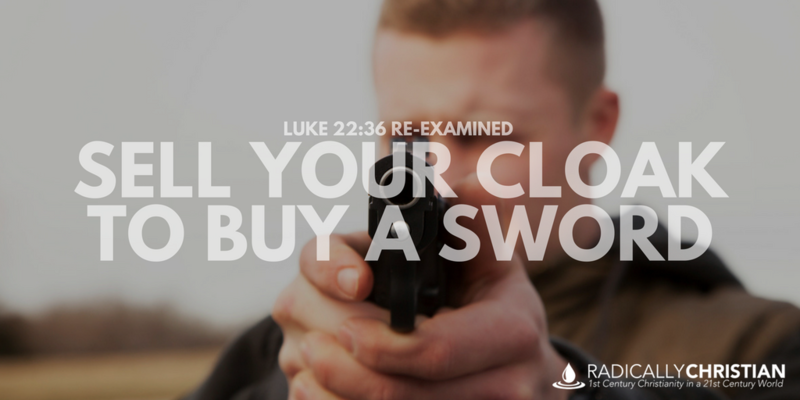 It’s time for us to resume our “Re-Examined” series by considering Luke 22:36, in which Jesus says, “Let the one who has no sword sell his cloak and buy one.” Many Christians use this passage as a proof-text for the use of deadly force in self-defense. But is that really what Jesus was talking about in this passage? Is Jesus commanding all of His disciples to arm themselves? Let’s take a look at Luke 22:36. Many Christians believe Jesus is teaching His apostles that when He sends them out into the world, after His ascension, they will need to carry swords in order to protect themselves from murderers and thieves. Many believe this passage gives clear and undeniable permission for Christians to arm themselves against evil people who would do them harm. I do not believe such an interpretation or application does justice to the context of the passage. I think when we look at the context of the passage, Jesus is not talking about self-defense at all. In fact, Jesus is very specific about why He wants them to have swords at that particular time. The chief priests and the scribes were seeking how to put Jesus to death (Luke 22:2). Judas consented to betray Jesus (Luke 22:6). Jesus took the Last Supper with His apostles, telling them of His coming death (Luke 22:7-23). Jesus told Peter, “The rooster will not crow this day, until you deny three times that you know me” (Luke 22:34). Everything leading up to verses 35-38 was about Jesus’ coming arrest. It would be very out of place for Jesus to be talking at this point about things they would need for the Great Commission, which wouldn’t happen for months. It seems more fitting that when Jesus told them they would need moneybag, knapsack, and sword, He was saying they would need those things that very night. They would need those things because of what was about to happen. Most importantly, verse 37 tells us why the apostles needed swords that particular night. Jesus said, “For I tell you that this Scripture must be fulfilled in me…” That first word, “for” is incredibly important. It is the Greek word “gar.” It ties verses 36 and 37 together and it assigns purpose. After Jesus explained the purpose for the swords, the apostles said, “Look, Lord, here are two swords.” And Jesus said, “It is enough.” We might ask, “enough” for what? Enough for eleven men to protect themselves on separate missionary journeys? That doesn’t make any sense. Two swords was not enough for later self-defense, but they were enough to serve the purpose He just explained, “That this Scripture must be fulfilled in me: ‘And he was numbered with the transgressors.’”Jesus did NOT say they needed swords to protect themselves. He said they needed swords because He was about to be treated like a criminal. As soon as they finished the discussion about the swords, they went to the Garden of Gethsemane, where Jesus prayed and where a group of armed soldiers came to arrest Him. When the apostles saw that Jesus was about to be arrested, they asked, “Lord, shall we strike with the sword?” (vs 49). Without waiting for an answer, an apostle drew a sword and blood was spilled. The servant of the high priest had his ear cut off and he was standing there bleeding. Jesus intervened, saying, “‘No more of this!‘ And he touched his ear and healed him” (vs. 51). Read those words of Jesus again, “No more of this.” No more fighting. No more bloodshed. In Matthew’s account, Jesus makes a more general statement, “All who take the sword will perish by the sword” (Matthew 26:52). Then Jesus asked the leaders of the Jews an important question, “Have you come out as against a robber, with swords and clubs?” (vs. 52). In other words, you’ve come out here with weapons as if I was some sort of violent criminal. I would rather this not turn into a debate about Christians and self-defense, because that’s not what this passage is about. If you want to study about self-defense, you’ll need to look elsewhere in Scripture. Luke 22:36 is not about self-defense, but about prophecy fulfillment. How can I be so sure of that? Because Jesus said it was about prophecy fulfillment. And who are we to disagree with Jesus?